We have heard a great deal about ATM skimmers, yet it’s almost difficult to spot one. A few skimmers are intended to look precisely like the card opening on the first machine and appended to the front, and others are totally covered up inside the ATM. 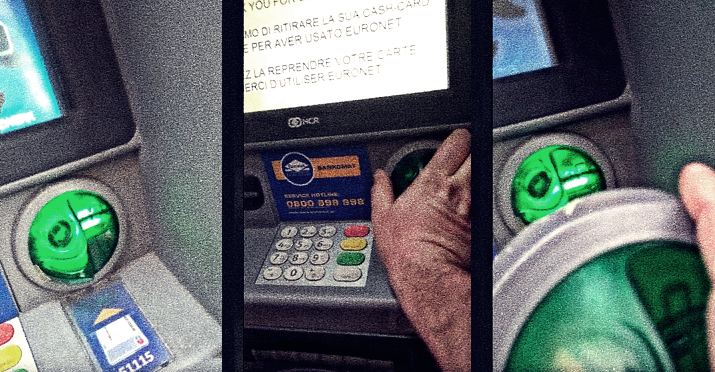 In any case, amid his excursion in Vienna, Austria, digital security master Benjamin Tedesco detected an ATM skimmer that was absolutely unrecognizable. So curium in downtown Vienna right at the metro station right by the hotels as you can see right here there is a change machine ATM now I posted on my linkedin a while ago about someone that actually deconstructed and ATM skimmer and one over here and notice that there’s a little bit of glue in just two you can see right here and just because i’m paranoid cybersecurity I side just to goahead and give the tug and i&#39;ll let you here so you actually comes right off this is very well made you can see it’s an exact replica actually don’t want man don’t do that don’t do this hold on ok so this one you’re fine this is actually a skimmer that actually steals credit cards this one right here you can tell is safe because you can’t take this off this right here with steal someone’s credit card so you’re welcome but yeah so I just found this out and I’m gonna go try to see what i can do about reverse engineering this like work with a cyber security company called carbon black but I thought you guys would be interested to see this right here at the cash machine over here in the main square in Vienna right by the metro station and it pays to be paranoid as you can see right here there’s a little bit of electronics and i’ll see if i can zoom in on this for here for you there you go so please be paranoid cybersecurity 101 in Europe always check for ATM skimmers before putting in your credit card alright everyone take care.